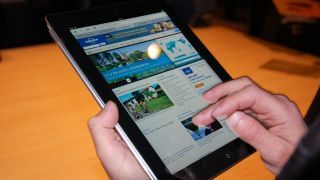 Apple fooled the world with the release of both the iPhone 4S and the new iPad. Aren't they clever! Remember the famous cable drop scene in Mission: Impossible where Tom Cruise abseils into a locked room full of lasers? That's how Apple design chief Jonathan Ive gets to work. We're exaggerating, but only just. In Walter Isaacson's biography of Steve Jobs, he describes Ive's design studio as "shielded by tinted windows and a heavy clad, locked door. Just inside is a glass-booth reception desk where two assistants guard access. Even the most high-level Apple employees are not allowed in without special permission." In a wonderful bit of pot-kettle-black criticism, other Apple employees describe Ive's design team as "secretive". When you're accused of secrecy by people who work for the most secretive company in the world, you must be pretty good at keeping secrets. Secrecy is in Apple's DNA. Everyone from the Board of Directors to employees of far-flung subcontractors knows the importance of keeping schtum and the penalties of loose lips: as one anonymous Apple Store employee puts it: "You have to be late, like, 15 times before they'll fire you. But if you talk to the press or speculate to a customer about the next iPad? That's the end of you." The culture of secrecy has made Apple the most talked-about company on the planet, kept rivals in the dark and made keynotes a magical occasion. However, in recent months there have been worrying signs that Apple's secrecy can actually harm it as well as help. Should CEO Tim Cook make Apple more transparent? There are several reasons why Apple likes to keep the rest of the world out of the Infinite Loop. The first and most obvious one is that it keeps rivals in the dark. For example, according to an anonymous RIM employee (for obvious reasons, most of the people you'll read about in this feature prefer to stay anonymous), the launch of the original iPhone sent BlackBerry executives into a state of sheer panic. There was no way the iPhone could work "without an insanely power-hungry processor", they believed. "It must have terrible battery life." As far as RIM's in-house experts were concerned, the iPhone was impossible. It wasn't, of course, but Apple's secrecy meant that RIM didn't know the world had changed until Steve Jobs said so. The second reason is that secrecy is a superb marketing tool. Apple is almost unique in its attitude to public relations: where other firms beg media outlets and bloggers for the slightest bit of coverage, Apple generally maintains a stony silence. The media effectively becomes Apple's PR machine, breathlessly reporting rumours and speculating about what Apple could have hidden up its sleeve. God help anyone at Apple who helps fuel that speculation, though. Apple's internal policies on social networking, blogging and trade secrets, a copy of which was acquired by 9to5mac.com, effectively ban all employees from pretty much anything. Employees: can't discuss Apple on their own websites; can't comment on Apple-related sites or blogs; can't discuss rumours, potential new products or improvements to existing ones with customers or anybody else; aren't allowed to speculate on rumours; and must ensure that "content associated with you is consistent with Apple's policies." Even "speculating on rumours with internal Apple colleagues is strictly prohibited." "As an Apple employee you have an obligation to protect the confidential, proprietary and trade secret information of the company," the document says. "For example, do not discuss any Apple confidential information including your store's financial or business performance, and the timing, pricing or design of Apple's products. Also, do not post pictures of the inside of the Apple Store - including the back of house - as those are not generally made public. Finally…" - and this one's obviously been ignored by whoever passed the document to 9to5mac - "…do not post or disclose the contents of any Apple policy." When it comes to secrecy Apple takes every possible precaution. Speaking to The New York Times, former iPhone engineer Mark Hamblin described how "they make everyone super, super paranoid about security." Secrecy "is baked into the corporate culture," the NYT reports. "Employees working on top-secret projects must pass through a maze of security doors, swiping their badges again and again and finally entering a numeric code to reach their offices, according to one former employee who worked in such areas." "Work spaces are typically monitored by security cameras, this employee said. Some Apple workers in the most critical product-testing rooms must cover up devices with black cloaks when they are working on them, and turn on a red warning light when devices are unmasked so that everyone knows to be extra-careful, he said." Apple also spends a great deal of effort trying to trap would-be leakers. Apple's Senior Vice President for Marketing, Phil Schiller, "has held internal meetings about new products and provided incorrect information about prices or features", the NYT says. If that information leaks, Apple has a pretty good idea where the leak came from. Similar tricks are used to prevent contractors from leaking anything juicy. "On occasion, Apple will give contract manufacturers different products, just to try them out," Reuters says. "That way, the source of any leaks becomes immediately obvious." Apple also splits manufacturing between multiple partners to prevent any single organisation knowing the bigger picture, and according to BusinessWeek, "Apple places electronic monitors in some boxes of parts that allow observers in Cupertino to track them through Chinese factories… at least once, the company shipped products in tomato boxes to avoid detection." Apple employees "monitored every hand-off point - loading dock, airport, truck depot and distribution centre - to make sure each unit was accounted for." The penalties for leaking product information can be severe. All subcontractors sign a confidentiality agreement, and if they break it they can lose the entire contract; obviously if Apple can't prove a particular firm did it but has a strong suspicion, the contract might not be renewed. When you consider the enormous quantities of components Apple orders, that's a big threat. And it may explain some of the pressure that lead to one tragic case in 2009 when Sun Danyong, a 25-year-old male, committed suicide after reporting the loss of an iPhone 4 prototype in his possession. Just because you work for Apple doesn't mean anybody will tell you anything either (and believe it or not that even applies to us here at MacFormat magazine too, although we wish it was different). Speaking to Popular Mechanics, one Apple Store insider explained that "we are completely in the dark until a keynote speech. We have no idea what is coming and are not allowed to openly speculate… I actually avoid the technology section of the newspaper so I have no points of view to accidentally comment with or drop into conversation."